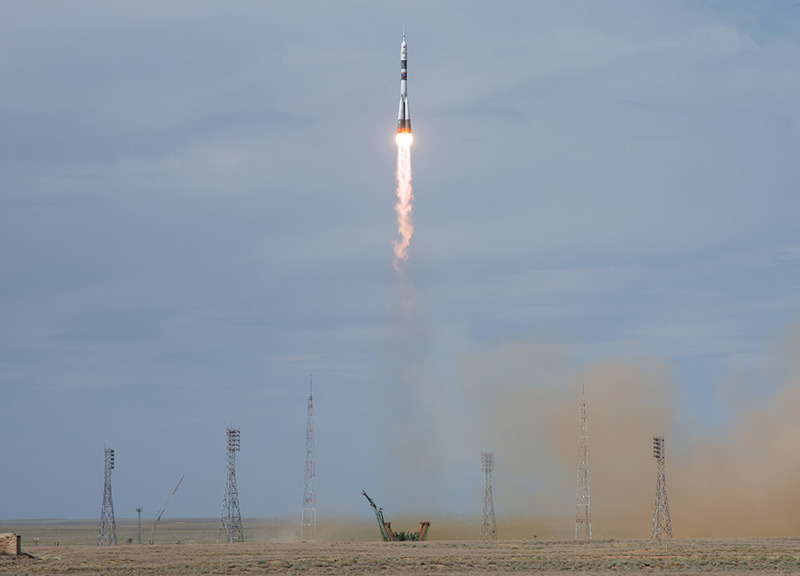 The Soyuz MS-09 rocket is launched with Expedition 56 Soyuz Commander Sergey Prokopyev of Roscosmos, flight engineer Serena Auñón-Chancellor of NASA, and flight engineer Alexander Gerst of ESA (European Space Agency), Wednesday, June 6, 2018 at the Baikonur Cosmodrome in Kazakhstan. Prokopyev, Auñón-Chancellor, and Gerst will spend the next six months living and working aboard the International Space Station. Photo Credit: NASA/Joel Kowsky. The Soyuz spacecraft carrying Serena Auñón-Chancellor of NASA, Alexander Gerst of ESA (European Space Agency), and Sergey Prokopyev of the Russian space agency Roscosmos is scheduled to dock to the space station's Rassvet module at 9:07 a.m. Friday, June 8. Coverage of docking will begin at 8:15 a.m. on NASA Television and the agency's website, followed at 10:30 a.m. by coverage of the opening of hatches between the spacecraft and station.